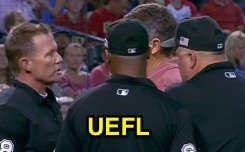 HP Umpire Jim Wolf left Friday's Dodgers-Diamondbacks game after a foul ball deflected onto his facemask. In the bottom of the 2nd inning, D-Backs batter Nick Ahmed fouled a first-pitch 97-mph fastball from Dodgers pitcher Pedro Baez back onto the right side of Wolf's facemask, knocking the traditional-style mask off Wolf's face and causing the veteran umpire to drop to his knees. Wolf completed the bottom half of the inning (one additional batter) before departing the game. 1B Umpire Alan Porter took over behind the plate, with 2B Umpire Brian O'Nora sliding over to first base and 3B Umpire Mark Ripperger remaining on the left side of the infield. Later in the game, Arizona broadcast cameras showed Wolf in street attire speaking with Porter during the 6th inning intermission. Wolf previously suffered a head injury after taking a foul ball to the facemask during a June 2014 game.